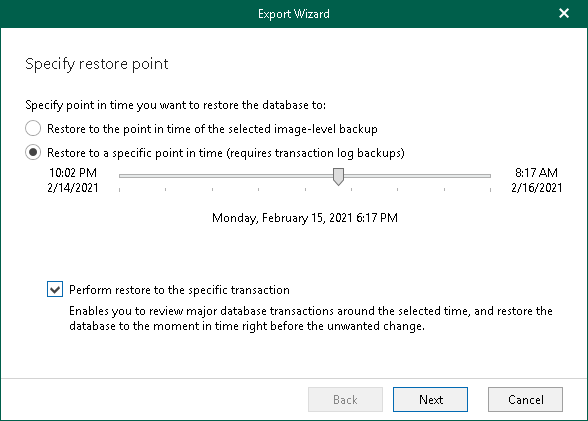 Select the Restore to the point in time of the selected image-level backup option to obtain database files as per moment when the current restore point of a VM was created by the backup or replication job. Select the Restore to a specific point in time option to obtain database files as per specified point in time. Use the slider control to choose a point you need. Select the Perform restore to specific transaction checkbox to obtain database files exactly as of the moment before undesired transactions. The Perform restore to specific transaction option requires a staging SQL server. For more information, see Configuring Staging SQL Server.